WhatsApp Status has become a new big thing and many of us are trying to download these WhatsApp Statuses. Here is how you can download WhatsApp Status on Android cell phone! There may be several alternatives to WhatsApp available for the users; there is something that keeps its users stuck. The new WhatsApp status update has further added to the great features of WhatsApp. You must have already noticed that in the changing status of your friends. Some people use photos while others use videos to set an interesting status. You might have even tried to download WhatsApp status of your friends but without any success. Fortunately, that was your last failure as we are about to reveal a simple set of steps to allow you to store the WhatsApp status of your friends. So the next time your friend changes his or her status, you are all set to capture it before it is gone. Fortunately, that was your last failure as we are about to reveal a simple set of steps to allow you to download WhatsApp status on android that your friend updated. So the next time your friend changes his or her status, you are all set to capture it before it is gone. Step: 1) Launch WhatsApp and go to the Status tab as shown below. Step: 2) Open the WhatsApp status of the particular contact that you wish to download. Step: 3) Minimize or close WhatsApp now and go to file manager. If the file manager is not installed on your Android phone, you can easily install it from Google Play Store. Step: 4) Android phone comes with a default File Manager. Go to the File Manager and tap on the WhatsApp folder to open it. Step: 5) You will find a subfolder ‘Media’ inside it. Tap to open. Step: 6) Next, you need to look for “.Statuses” folder that will not be visible normally as it is hidden by default. You need to change the settings to “Show hidden files” from the options. Now the folder will be visible. Step: 7) The .Statuses” folder contains the status files of all your contacts that you accessed. You are now almost there to download WhatsApp status of anyone on your list. Step: 8) You can move the desired status file to any other folder including gallery on your Android device. Just press and hold it till you see the copy option. Tap on it to copy. Step: 9) You can now move to the specific folder where you want to store the status. If you want to download it in your gallery, paste it in the DCIM folder. You will find it in the File Manager. 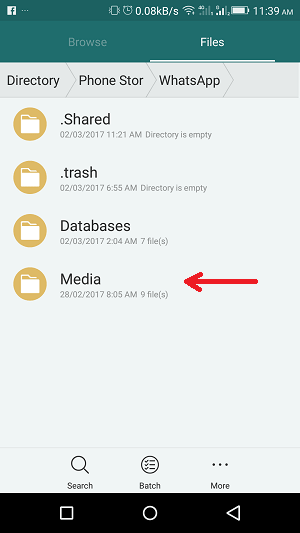 Step: 10) Now, you will be able to see the status of contact in your Android phone Gallery even when the contact has switched to a new one. Note: The above-mentioned steps are strictly for the Android smartphone. Also, the images shown correspond to the default File Manager on your Android device. If you have any comments on the article “Here Is How You Can Download WhatsApp Status on Android Cell Phone”, then leave in comments. If you liked the article then do share with your friends!